Transition University St Andrews are offering some cyclists the chance to become a fully qualified Bike Mechanic or a Bikeability/Cycle Leader free of charge. In a bid to gain new volunteers for the carbon cutting organisation’s bike hire scheme, Bike Pool, we are asking a small number of cyclists to commit to helping out at cycle events in return for a place in the fantastic top class cycle courses. The Silver Velotech Award (formerly Weldtech) is an accredited course recognised by the Bicycle Association, at the end of which the successful participants receive the Gold, Silver or Bronze Award which is a recognised professional mechanics qualification. The Velotech Silver course is run over 14 hours (over two days – Tuesday, Wednesday February 5th and 6th in Edinburgh). Places are limited to four participants per course, and covers puncture repair, safety checking, record keeping and adjusting all areas of a bike. The cost of the Velotech Silver Award is usually £300 per participant. It is held at The Bike Station in Edinburgh. Expenses will be paid for travel. The award, plus the hands on experience provided at Bike Pool will provide you with the skills and qualifications to become a professional bike mechanic! If Led bike rides are more your thing for both adults and/or children then the Cycling Scotland Cycle Trainer Course is for you. A four day course held over two weekends March 2,3 and March 9,10. From 9.30am to 4pm. Usually costs £300 per person but Transition are offering this for free to three lucky cyclists aged over 18. As a Cycle Trainer, you can conduct risk assessments, plan, develop and deliver learning sessions to anyone that wants to cycle. 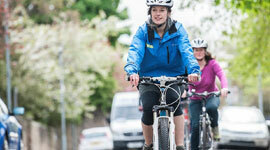 If delivering courses to children, this is known as Bikeability Scotland Training. You will need a bicycle in working order and clothing appropriate for the weather and a commitment to run Bikeability courses to primary school aged kids or led bike rides around St Andrews.